Subscribe to the 'Hamster email update! 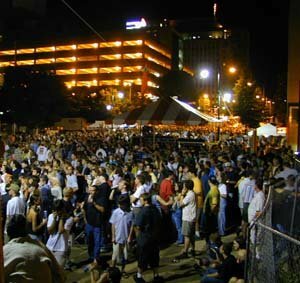 Downtown() For long time fans of the event, this year's City Stages was a welcome success. But for Beatle Bob followers the event comes as a bittersweet pill to swallow. Today's announcement by 'Beatle' Bob Matonis that he will not return next year has many pronouncing doom for Birmingham's World Class Music Festival. And with good reason. In years past, Beatle Bob fans have made up as much as half of the 4 PM Blockbuster stage crowd. 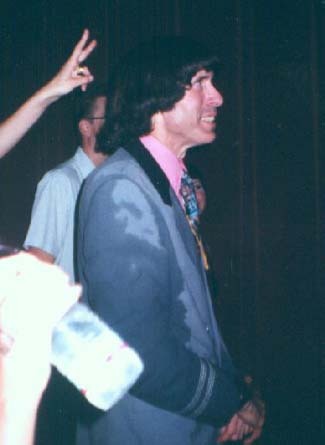 In the afternoon press conference, Matonis described his Stages experience this year as "very un-hip." His complaints stem from the fact that not a single artist invited him onstage to perform his wild gyrations. "I really thought David Byrne would ask me to dance, considering how weird he himself is." But most artists seemed to get along fine this year without Matonis's uncoordinated spins and crazy hip jerks, and the unusual City Stages crowd seemed basically indifferent to his presence. Except for Bonnie Hedges who had a run in with Matonis at the Colonial Bank Dance Depot. "I was doing some swing dancing when this strange little man came up with his arms flailing and tried to put a make on me. When I made it clear that I was not interested, he backed down and headed for the Beach Boys performance." Another reason for Matonis's displeasure is that City Stages officials made him pay for his weekend pass much like the volunteers, although they did include an 'ALL' access pass in exchange for one shift at the CS2K1 children's tent. During his shift, Matonis was ridiculed by the kids, and repeatedly thrashed at Tekken Tag Tournament on the Sony Playstation 2. In a final blow to Matonis's Stages cachet, he was forced to leave the backstage area for Wynonna because he reminded her too much of her ex-husband. Stages officials were saddened by Matonis's announcement, and hope that he will reconsider. But from all appearances, it is already too late. "Where have all the hipsters gone," asked a petulant Matonis as he boarded his plane to St. Louis. "Am I the only one left in this Mod forsaken world?" Downtown() An emergency situation arose Sunday evening at the Blockbuster stage when the toilet in Wynonna's trailer became stopped up from over use. It is not known exactly when the blockage occurred, but stage volunteers reported no problems after legendary singer-songwriter John Prine checked out following his 10 PM show the night before. "We went over our checklist before Wynonna's arrival on Sunday, and everything looked good," said Stage Manager Tucker Barr. "But just before her sound check Sunday morning, she came storming out of her trailer demanding to know why the toilet was clogged." Backstage workers report a lengthy interval between Wynonna's arrival and her noisy exit from the trailer. One volunteer heard sounds emanating from the rear of the trailer and Wynonna muttering something about "damned low flow toilets." Once Barr realized the gravity of the situation, he immediately put in a 10-200 call on the site channel. Supply Coordinator Phillip Barnes instantly recognized the call for a plunger based on his past experience managing the stage for John Popper and George Clinton. Luckily, Maintenance Coordinator John Hulsey was already at Wal-Mart trying to purchase some golf cart batteries. Receiving the request on his pager, Hulsey added a plunger to his shopping cart and raced back downtown. 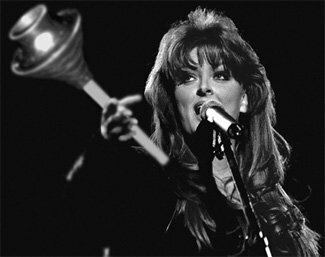 A volunteer was able to unclog the commode before Wynonna finished her sound check. The plunger was later sold at the City Stages silent auction, where a lucky fan took it home for fifty bucks. Downtown() In a Stages first, Dan Burks decided to forego his annual Dippin' Dots pilgrimage in favor of regular ice cream, offered for the first time at this year's festival. "I couldn't quite believe it when I saw the regular ice cream, and for a minute I was taken aback," said Burks. "But then the craving for something cold and smooth overwhelmed me and I headed for the Cold Stone Creamery booth." This common southern summer craving seems to have been on the minds of many Stages fans as the line for regular ice cream stretched all the way down 20th Street at times. The introduction of ice cream to the event is in keeping with this year's back to the past theme of lower ticket prices and better bands. 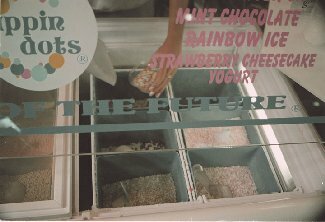 Rather than the 'ice cream of the future,' event organizers felt that Stages visitors might enjoy some good old-fashioned churned ice cream. According to Burks, ice cream is a lot better than Dippin' Dots. "Although Dippin' Dots is colder, it is certainly not very creamy. In fact it is kind of chalky, and it leaves a strange aftertaste." In addition to the ice cream, Burks also purchased an official City Stages poster. "I normally buy the t-shirt, but this year I decided to go with the poster. It's the one with the distorted looking people in some sort of African garb." Burks and other ice cream fans say they will be back next year for sure. Downtown() The band Runa Pacha was last seen leaving the Dance Depot on Saturday after their 2 PM performance. Concerns were raised when the band failed to show up for their 5 PM performance at CS2K1, and soon after an all out search was mounted. The Ecuadorian band, known for their peaceful pan piping, does not have a firm command of the English language, and Stages officials are worried about their safety. The only lead so far is a tip from a man who claims to have seen a van full of "mexicans" driving away from the 20th Street entrance to City Stages on Saturday afternoon. According to the witness, the van was "full of smoke" and appeared to have a flat tire. Anyone with more information regarding the whereabouts of Runa Pacha should contact City Stages and not the local police.